An outhouse at the back-end of the camp. During World War II not all the internment camps established by the federal government were in California. Several of them were created in Texas, with the largest one in Crystal City built on the grounds of an old migrant farm worker camp. A water tank near the camp’s pool was spray painted with information about a 2002 reunion of internment camp detainees. Other than some historical markers and informational signs, you would be hard-pressed to find any evidence of the old camp, which has been taken over by two schools and athletic facilities operated by the Crystal City Independent School District and a part of the dormant municipal airport. There is no museum or visitor center. Nor a fence or guard towers or buildings left standing from the camp. But you can find evidence. My guide was Buddy Guyler, a history buff and amateur anthropologist, who attended middle school on the property in the 1950s. He showed me foundations of old administrative buildings and homes for camp supervisors that sat just outside the fenced camp. We visited the remnants of a large circular pool that internees built in an irrigation tank. It was the best swimming pool in town and Buddy remembers sunny days when he cooled off in it when he was a boy. You have to use your imagination to see hundreds of camp buildings, small homes and other camp structures that once housed thousands of internees and their families. Many of them were born and died in the on-site hospital. I visited the Crystal City Library and a helpful librarian brought out an old box of letters hidden in a filing cabinet in a hallway. The letters were addressed to a German internee, Walter Steiner and his wife Gerda, and came from friends and relatives in Germany, California and Port-au-Prince, Haiti. Some of the letters were mailed in 1946 and 1947, more than a year after the end of World War II. The envelopes were stamped to note they were examined by a censor. One letter writer said that she hoped the Steiners can be discharged soon and remain in the United States because conditions in Germany are “none too good” with strict rations on food — too little to live on and too much to die. Later, as darkness approached, I drove down a dead-end street to see if I could find some structures that I was told still exist at what would have been the back-end of the camp property, near a city dump. I stopped in front of the last house, where debris was aflame near a driveway, a way the homeowner discarded trash. I asked the man who was standing out front whether he knew about the internment camp. “The concentration camp?” said Manuel Gonzalez, the homeowner. “Yeah.” He said that the buildings were all collapsed, but he was quite happy to let me take a look. Manuel and his 10-year-old daughter, Aaliyah, led me down a little-worn path, pushing past overgrown bushes and stepping around prickly pear cactus, and soon we stood in front of what may be the only on-site wooden remains left of the camp, five large piles of wood where five buildings had collapsed. One after another, we poked through the mounds of broken boards and shingles and junk and found a few relics: a bicycle tire, shoes, bottles and ragged slacks. The largest of the buildings appeared to have been a school. Manuel said desks were found there, and a rusty metal skeleton of a chair. Manuel said while he was growing up he combed through the wreckage and his brother once found a SKS rifle that had Japanese writing on it. I left with a piece of a door that still had a rusty door knob attached. I brought it to Buddy’s house to see what he thought and for safekeeping. He said the old gray pine wood didn’t immediately indicate it was from the original camp. He said the first buildings were built with redwood. I left in the dark. The next day I spoke to Betty Fly whose father was a supervisor at the camp and to Virginia Payne who worked in the camp post office. I’m in contact with one internee who was born in Germany and whose parents moved to Cincinnati when he was a young boy. He was arrested while in high school one day and sent to the camp where he spent a good part of the war. He tells a riveting story and I will write about it in my upcoming book. I’m searching for Japanese internees who can shed a light on that time. Write me if you have leads at charles@charlesboisseau.com. 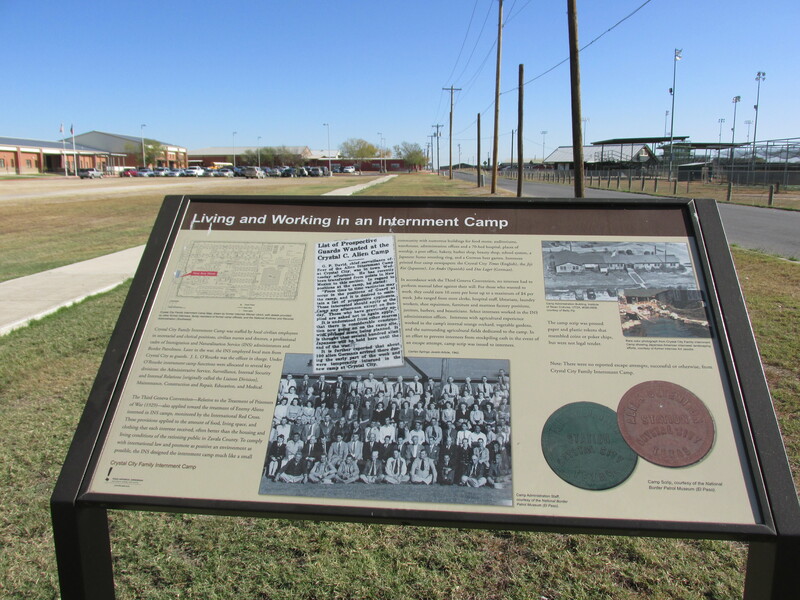 Sign includes a photo of a graduating class from the high school that internees attended. Manuel Gonzalez shows an old tire he found while his daughter looks on. This shows what remains of the circular pool internees built. A letter sent to a German internee more than a year after the end of World War II. Note the letter was examined by a censor. The letter writer says that she hoped the internees, Mr. and Mrs. Steiner, can stay in the United States because conditions in Germany are “none too good” with strict rations on food — too little to live on and too much to die. HIstorical marker near foundations of buildings that were located just outside the camp fence. In the background you can see school facilities that take up much of the old camp site. Hi, I was reading your comments about the crystal city internment camp buildings. We have a couple of buildings still standing that were moved from the camp to our property. I was born and raised in crystal city.